Bought this Chiloschista lunifera about 6 months ago. Looked to be growing ok with a minimum of 14C. Reduced the watering when winter started. 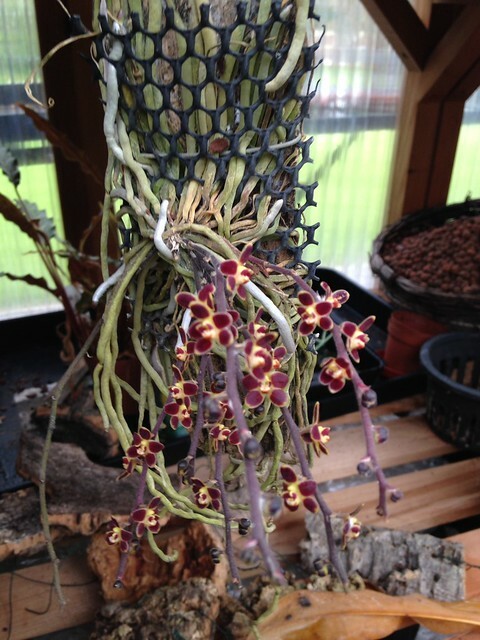 As you can see from the photos the plant is mounted (and for those who don't know it's a leafless orchid). I can't believe I have rotted it, I just mist it occasionally and it sits with a group of Bulbophyllums. 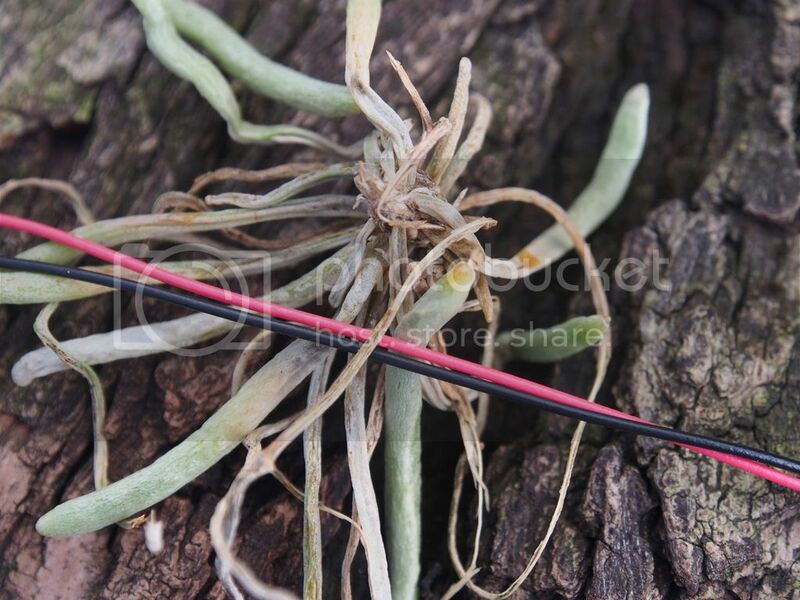 The base of the roots have all dried out but the roots still absorb water and go green when watered. It's an unusual species and I was taking a risk growing it but really want to try them again if this one is about to die and need to learn from this experience (despite the high cost). I found this and hope it helps. 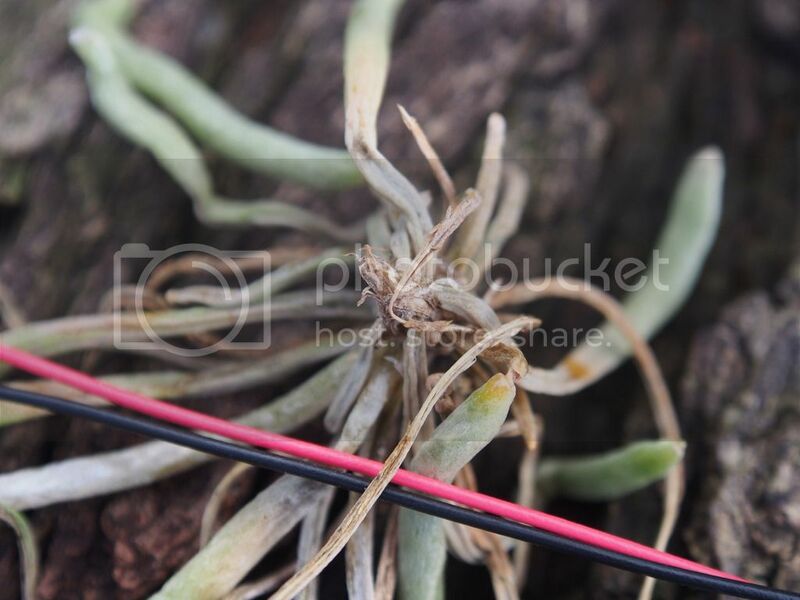 I lost my only Chiloschista in a storm a few years back (the winds took it somewhere...never to be seen again) but I didn't do a heavy restrict on the watering in the winter. I didn't water it as much as I did during the summer/warmer months but I still watered it 3x a week and when I did, I soaked it and the sphag on the mount really well. It would be drippy. I grow under lights and in a heated house in the winter so that moisture did dry out fairly quickly but it got watered regularly. I grew it in medium bright light. If you reduced the water too much...that might be the problem. IME, it would lose some of the older roots from age but I never lost the upper roots like your pictures show. Thanks guys, I think I am underwatering it. Maybe I need to add Sphag but I bought it like this so thought I would leave it alone. Will add some moss around the plant and increase watering. Good luck! I hope it recovers quickly for you! Thanks, some people think it will recover and should then be easy to grow. Yea, I had the it sitting on a nice little pad of sphag so the moisture hung around for awhile but it would be dry by nighttime. It grew and bloomed beautifully...until Mother Nature opted to steal it away from me. It was an easy grower for me. I don't remember which species I had but they all pretty much enjoy the same culture. I see decent roots there so I'm betting you can get it to bounce back. It doesnt look underwatered to me, more like growing point in the centre rotted. If you have a humid atmosphere, you should only water either early morning or in the middle of the night, it needs to completely dry out in the daytime. Try not to get centre part wet at all is safer. 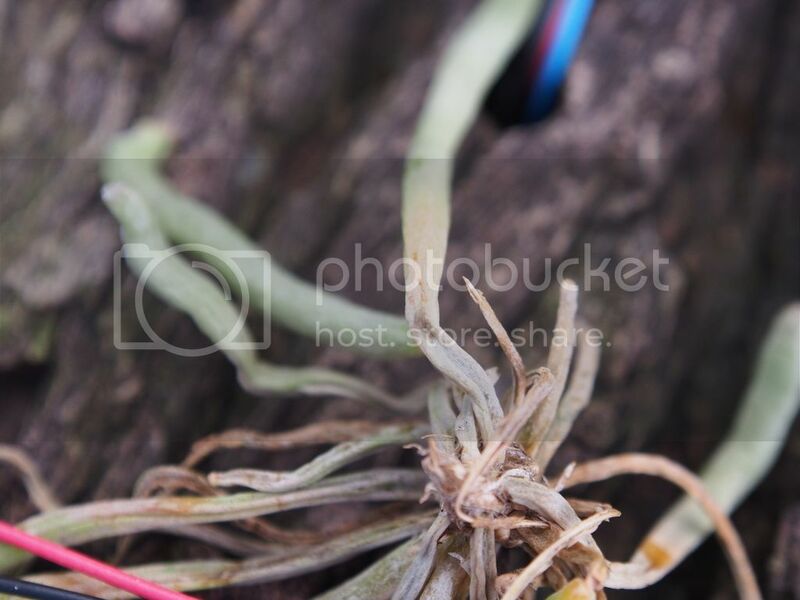 I'm afraid it wont regrow as the stem is rotted. Last edited by SilverShaded; 06-27-2016 at 06:33 PM. Thanks, it is fairly humid this time of year and I do water very early in the morning. It's a shame as I really tried to make sure it was ok. If I get another one (which I think I will) then I will do it differently. Appreciate the help. It is certainly a learning experience as I usually can grow anything. If the weather is a bit cool and its humid, i would only water 1 or twice a week at most. I'm currently growing a taenifolium species, left it for a week in the height of summer while we went on holiday and it hasnt suffered at all, in facts its grown. 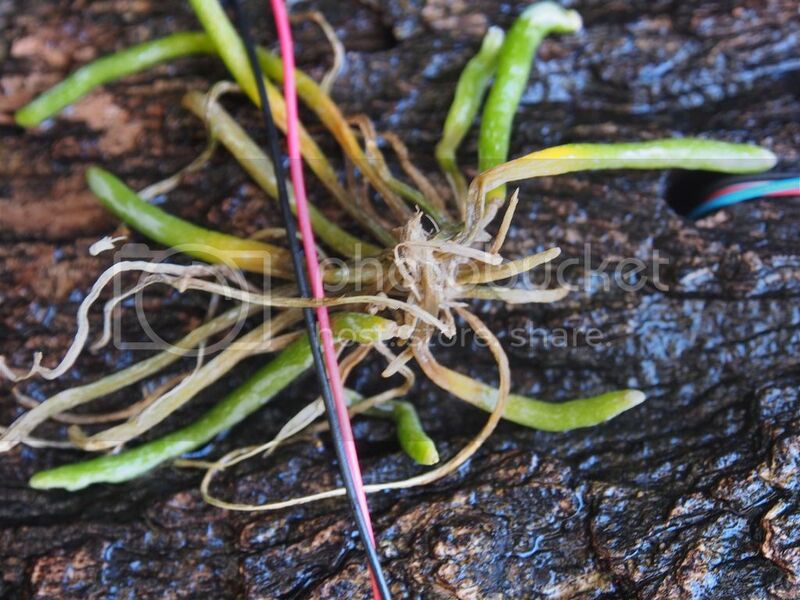 These rootless species tend to be very exposed to air movement and dry out very fast. Also in the cool/dry season they get very little water at all for several months. Interesting, if this one does die completely I will do things differently next time. I was looking closely at it today and you are probably right that it's rotted. One root looks ok so I will leave it there and water it less and see if that helps. Don't want to seem negative, but if the centre is dead its game over. Absolutely, I am going to see how it goes. If the centre is dead it will go in the bin. It probably is but while there is still hope I will hang in there.